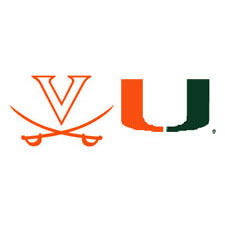 The Miami Hurricanes and the Virginia Cavaliers faced off on Saturday in NCAA football and while the Cavaliers gave a really good account of themselves and went close to causing an upset, ultimately they couldn’t keep up with the Hurricanes. Miami’s 44-28 win over the Virginia Cavaliers means they have now won all 10 games that they have been involved with so far this season, seven at home and three away. Virginia’s record isn’t great as things stand. They’ve won 6 and lost 5 but they did show spirit against the best side in the division; and this was duly noted by all popular sports betting operators and fans. It was Virginia who came out of the traps looking the brighter in the Hard Rock Stadium. Kurt Benkert helped Virginia race into a 7-0 lead with a perfect 5-5 to four different receivers. It was his 33 yard pass to Olamide Zaccheaus that saw the game’s opening drive. Benkert was perfect throughout the first quarter and threw an unbelievable 75 yard touchdown pass for Joe Reed to make is 14-0 in the Cavaliers’ favour with just a couple of minutes of the quarter remaining. It was in the final seconds of the first quarter that Miami got themselves into the game and they managed to slash Virginia’s lead in half after a five-play scoring drive saw Malik Rosier deliver a 10 yard touchdown pass for Ahmmon Richards. The Hurricanes then went on to level proceedings with slightly over 9 minutes left on the clock after Rosier hit a 36 yard touchdown pass to Dayall Harris. At this point, bookmakers such as Unibet.com and fans looking at the match knew this was going to be a fiercely contested game. Virginia weren’t ready to give up yet though and in light of Miami’s impressive resurgence, it was the Cavaliers who got back on top thanks to a perfect pass by Kurt Benkert once again. Virginia’s sports betting fans would have been hoping this would reinforce their team’s dominance and kill Miami’s spirit. As Kurt played in Andre Levrone for a 33 yard touchdown and this saw Virginia head into the break 21-14 up. Benkert was extremely impressive in the first half with 17 out of 18 passes successful for 262 yards and 3 touchdowns. After the break, Benkert was at it again. He connected well with Daniel Hamm for a 26 yard touchdown which saw Miami now 28-14 behind and sinking fast. This shocked the Hurricanes into action though with Malik Rosier playing a 9 yard touchdown pass for Lawrence Cager with 10 minutes left of the third quarter. The Hurricanes were only a touchdown behind. In a whirlwind seven seconds, the impressive Benkert was intercepted by Jaquan Johnson, who went on to score a touchdown, levelling proceedings. Then with only seconds remaining in the first quarter the Hurricanes took a 31-28 lead thanks to Michael Badgely’s 44 yard goal. They weren’t done there either. Virginia’s offense turned the ball over in the middle of the fourth quarter and Miami then made it a two score game with Malik Rosier touching down with just over four minutes of the game left to play. Travis Homer also managed to score late on with a 19 yard touchdown and this wrapped up proceedings at 44-28, to make Miami’s win even more emphatic.